What a gripping and extremely creepy story!! Reviews seem to be all over the place on this one but I couldn’t put it down. I found this to be a VERY unique and original book. What would you do if your beautiful child was really very disturbed on almost every level? It’s easy to think we would all do the right and most obvious thing but this book shows how difficult and heart-wrenching those choices can be. Suzette and Alex have what seems to be the picture-perfect life: a stunning home, many professional accomplishments and a beautiful child. Except that Hanna is 7 years old and does not speak. Is it autism? Something more profound? And is it a willful refusal to speak, or an inability to speak? The author paints a fascinating picture of this family told from two POVs: Suzette and Hanna. Suzette stays at home with Hanna and home schools her. It soon becomes very clear that she is dealing with much than just a child with developmental disabilities. Something is very, very wrong with Hanna. But Suzette’s husband is in deep denial over Hanna because all he sees is a bubbly, happy and highly intelligent child who just acts out sometimes because she can’t use her words. I read this book in almost one sitting. The author does an amazing job of building tension so that I absolutely could not stop reading this very disturbing story. There is a sense of foreboding on almost every single page. This book is not for everyone but I loved the imagery, the plot and the dynamics between Suzette and Alex as a married couple and between Suzette and her daughter Hanna. 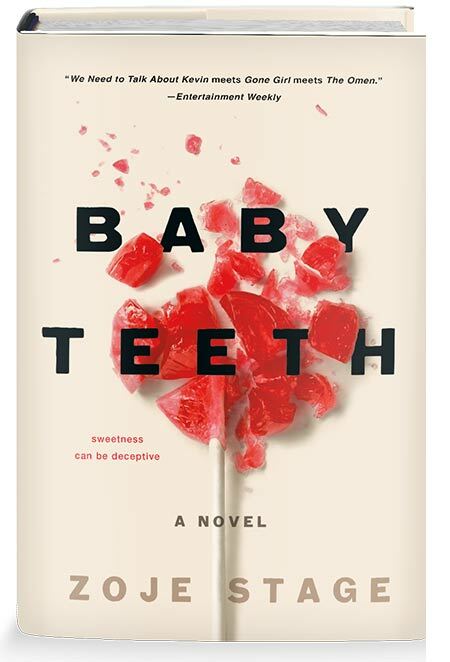 ‘Baby Teeth’ was one of my most anticipated books of the summer. And it did not disappoint. Sometimes I felt sympathy toward Hanna because of the depth of her disabilities but mostly I was on the edge of my seat for the beautiful and selfless Suzette. And kudos to the author for shedding light on the difficulties of living with an autoimmune disease! This added an unexpected depth to this book. Zoje Stage is a new voice in fiction and I cannot wait to see what she dreams up next! Thanks for chance, this sounds so good!